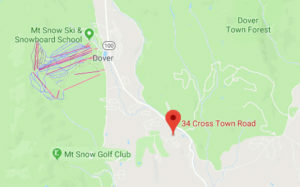 When you hear someone mention tree skiing in Vermont they typically are talking about Jay Peak, Stowe or Smugglers Notch who have some very nice glades and adventuresome terrain. I have skied all three places and the talk isn’t cheap. They all have great tree runs to offer with Jay leading the pack. Interestingly tree skiing at Mount Snow has been advancing steadily over the past few years. In the past the glades alongside Olympic on the Northface were the only offering but over the past few years Mount Snow has been thinning the brush and saplings in other areas and opening up some very interesting and fun terrain. The glades off the right side of Ridge are a friendly introduction to tree skiing at Mount Snow and the trees are comfortably spaced. The trail Ridge is a blue trail and by skiing these glades you will end up on one of two trails below. If you take a shorter route through you end up on Uncles which is another blue trail. If you work through the trees parallel to Ridge you will end up on Low Traverse which is green and will link you back to Ridge. 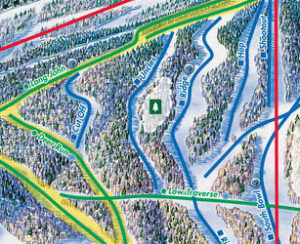 As you look at the Mount Snow trail map the map indicated a very small area but in reality you can ski through the trees all the way down to Low Traverse. Stay the course… there’s more. 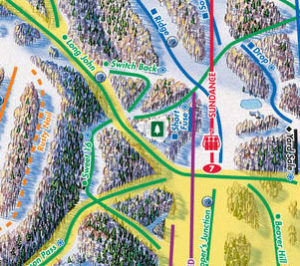 When you get back on Ridge you may feel like you are compelled to race to the bottom and either jump on the Sundance lift or back to the Bluebird or Summit lift depending on the lift lines but there is another tree skiing stash at the top of the tumbleweed lift. Stay to the right on Ridge and look for the unloading area of the Tumbleweed lift. Veer right and a quick left for a short glade that will dump you onto Long John. The pitch is a little steeper in these trees so pay attention. The Ego Alley lift is an older triple and it isn’t always running. Mostly busy weekends and holidays. When it is open I have avoided it many times because it is slooooow! BUT when the Bluebird and Summit lifts have a twenty minute (feels like an hour) lift lin e I will take any lift with little to no wait time. So glad I did because we found the tree skiing to the left of the Ego Alley lift to be excellent. I would say this area not to be for beginner tree skiers. There are some steeper pitches and tree placement is tighter than previously mentioned. Actually there is a vast canopy in the pines and it blocks out a lot of sunlight giving it an eerie feeling. A spooky name would be appropriate. (The witches woods?) This glade will drop you off on Low Traverse as well which will put you on the Ego Alley lift trail with options all the way down to the base. 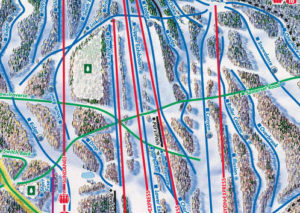 My next post will give some tips on glades and tree skiing at Mount Snow for areas that are not listed on the trail map. Stay tuned. Use the buddy system, don’t ski in the trees or glades alone. Know your terrain. Don’t ski where you are unaware of streams, cliffs or expert terrain. Don’t focus on the trees, focus on your line between the trees. Kids love glad skiing. Tell them to focus and slow their speed down. Don’t ski glas late in the day when fewer people are around. You may need help. Always wear a helmet. Trees don’t move.